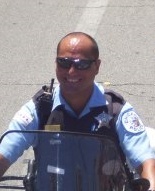 Joe has been a police officer with the Chicago Police Department for 13 years. During those years , Joe has worked in different units throughout the city, working the majority of his police career assigned to the 23rd District. Before joining the police department, Joe was a Child Welfare Specialist for the Illinois Department of Children and Family Services, where he investigated allegations of abuse and/or neglect of minors by their parents or caretakers. Joe has a bachelor’s degree in bilingual education/liberal arts from Northeastern University, and a master’s degree in criminal/social justice from Lewis University. Joe has been on the board of LGBT/GOAL for the past 4 years, and has been involved in organizing and promoting many activities sponsored by the organization.Â Joe assumed the role of Secretary of the organization in March, 2010.